Arrival in Milan; tour of the city and Mass at the 5th largest church in the world – and amazing Gothic construction. Fr. Scott Courtney’s homily in the fantastic Duomo. Today We Saw the Holy Shroud, the Body of St. John Bosco and Met the Daughter of St. Gianna Molla who gave us a one-hour talk. I cannot express in words what we did, saw and experienced today. It was truly and spiritual powerhouse. Seeing the Holy Shroud was breath-taking. It is a Love Letter from God written in his own blood. The church and compound started by St. John Bosco and his body on display with Mass at an ancient church left people gasping. Then we met St. Gianna’s daughter, the one she died to save. What a tear-jerker 1-hour talk she gave us and then joined us all for dinner. And that is just the surface. Enjoy the three videos which give you an idea of today. 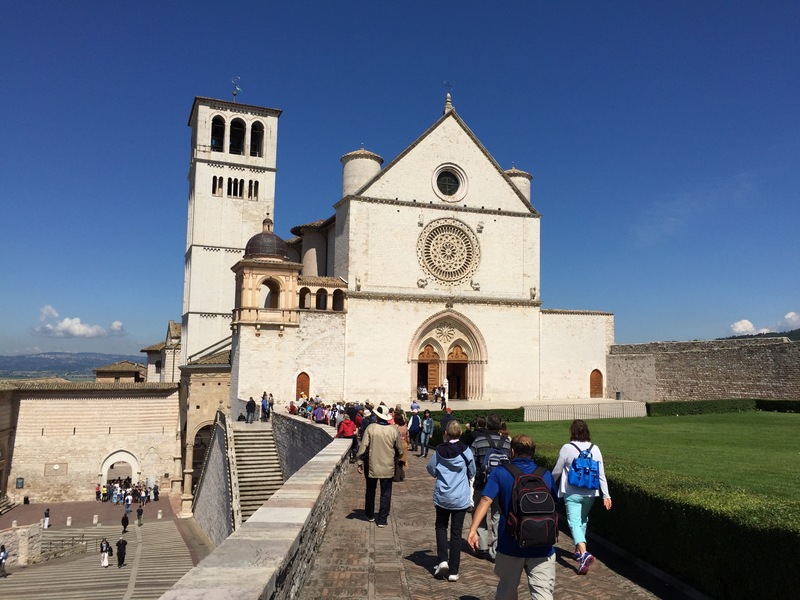 From Turin to Assisi: Message from Gianna Molla, Beautiful Drive thru Italy, Mass and History in Assisi. 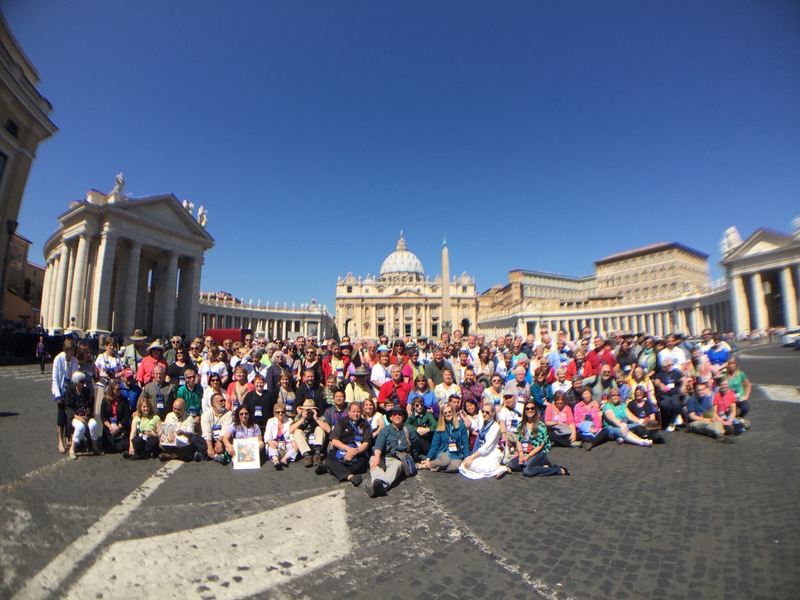 What a great group of Catholic pilgrims and adventurers! Prayers on the bus, Rosaries, conversion stories and our new Footprints of God DVD “Abraham, Father of Faith & Works. Enjoy our pilgrimage with us. I know it seems like all we do is eat, but you have to remember where we are – ITALY. This is the best food in the world. Fr. Courtney’s energetic and fun homily in Assisi. Then to the crescendo – visiting the tomb of St. Francis and the magnificent church built to hang over the mountain. At noon everyone was free to wander through this medieval walled city filled with flowers and quaint buildings. The afternoon was free for lunch, shopping, prayer, exploration and friendship. The weather could not be better with clear blue skies and a mild 70 degrees. Everyone is fine and loving every minute. Today I put in a lot of pictures because the city demands pictures at every turn. Enjoy! Covered a LOT of ground today and people said it was the most powerful Mass – in front of the Eucharistic Miracle of Lanciano. The Holy House of Loreto was also an amazing stop. Enjoy the movie of today’s events, the homily by Teresa Tomeo’s husband, Deacon Dominic Pastore and two of our doctors talking about the heart muscle and blood of the Eucharistic Miracle. A banner day with perfect weather! We spent the day in San Giovanni Rotundo at the churches of St. Padre Pio. We had Mass where he celebrated Mass and saw his body displayed in the glass casket. Then to Mount St. Michael to visit the cave where Michael the Archangel appeared four times and the only Catholic Church in the world not consecrated by a bishop since St. Michael said he consecrated it himself. Enjoy the day. I put up two videos: one of the day’s adventures and one of my short talks telling a short biography of Padre Pio. 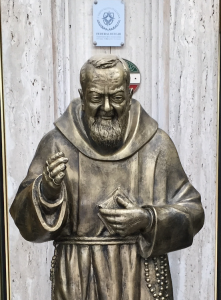 Today we said Good-bye to Padre Pio and the Archangel Michael and left San Giovanni Rotundo. 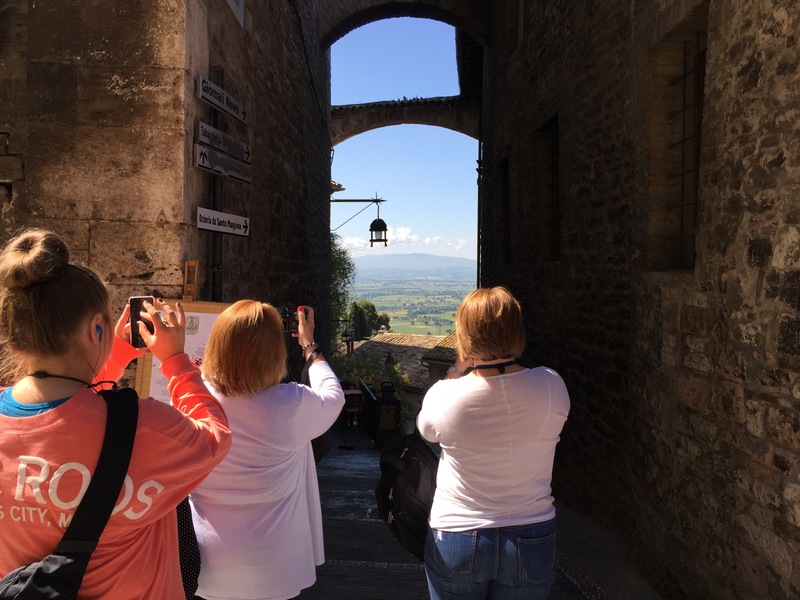 We drove through the beautiful mountains to Manoppello to see the Facecloth of Christ. It was that which was found in the Tomb in John 20. Everyone was stunned by the relic and we had Mass in front of it after which we toured the museum. Along the way to Rome we played “Catholic Answers Live” on the buses, and Stump the Priest and more. It was fun and kept everyone entertained so the trip seemed short. 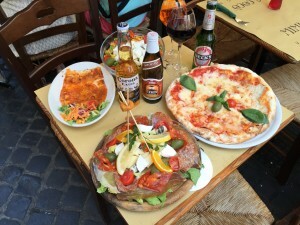 We arrived in Rome and settled in to our hotels. Enjoy the video. Enjoy our day in Rome visiting Peter and Paul. Today many pilgrims returned home to the USA. But 58 who stayed for the Extension trip had a great day. Beautiful blue skies with 70 degrees and breezy. Very enjoyable! We toured the Vatican Museum, Mass with the Saints (many relics) is San Salvatore, free time in Piazza Navona and a tour of the Shroud Exhibit here in Rome at the Legionaries University. Great day! We went to the Church of San Stefano Rotundo in Rome – the martyrdom church with the graphic images of early Christians and their suffering for Jesus Christ. I gave a short talk on martyrdom and faithfulness to Christ. We also toured St. Peter in Chains, San Clemente and first century Rome, the Roman Forum and the Coliseum. Liz Lev was incredible as she guided us through Ancient Rome. I have provided two short 6 minute video clips of me (Steve Ray) and Liz Lev as we talked to my group in the Ancient Rome Forum today. First, Liz spoke about the clash of empires: the Roman Empire and the Kingdom of God. The key line is this: Rome had just claimed that the Emperors had become gods – man could now become god. At the same time Paul and Peter come to Rome and say, “Wrong, God has become man! which set up the whole cultural clash that continues today. Second, I gave a short talk about how Americans are at a great disadvantage when it comes to reading the Bible because we are no longer in its biblical and cultural context. I explained how coming to these biblical lands helps up immerse ourselves in the biblical culture to help the Bible come alive. 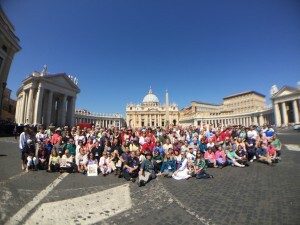 For upcoming pilgrimages, check out our site at www.FootprintsOfGod.com: To Rome including Mother Teresa’s Canonization, Israel including Part 2 – Digging Deeper, Lourdes & Fatima, Poland for the Year of Mercy, Biblical Turkey, St. Paul Cruises, Guadalupe, Germany to Study Luther and the Reformation, Shrines of France and more. Contact Suzanne at 800-727-1999, ex 121. What a great day with great weather, great folks and great sites. Growing closer to Jesus Christ and his Church is the whole point. Enjoy! Always sad for new friends to say Good-bye. Enjoy.